I can still hear them faintly. You could hear and smell the trade winds coming off the ocean, moving through the guava, ohia, and lychee trees and sweeping up to our house on Kukuau street in Hilo. As the wind poured into our yard it mixed with the fragrances of orchids, plumeria and puakenikeni and washed in through our windows as a gentle mist as the wind chimes on our lanai recorded its arrival. How many nights I lay awake listening to the melodic tinkering of those wind chimes as the gusting trade winds climbed Mauna Kea. Over the years their sound became inextricably linked with our time in Hilo; even today 23 years later the sounds still play in my mind and in my heart. The gentle rains of Hilo. Fresh out of graduate school at Oregon State University my wife Susan and I moved to Hilo in January 1992; me to start a faculty position at the University of Hawaii, her consulting for the Forest Service and 4 months pregnant with our first child. Despite warnings from several colleagues not to get trapped in a small, isolated “teaching school” the thought of living in Hawaii, both as a surfer and marine biologist, was just too overpowering. Looking back I realize it wasn’t the best career move for either of us but it was a great life move. If I had to do it all over again I wouldn’t change a thing. 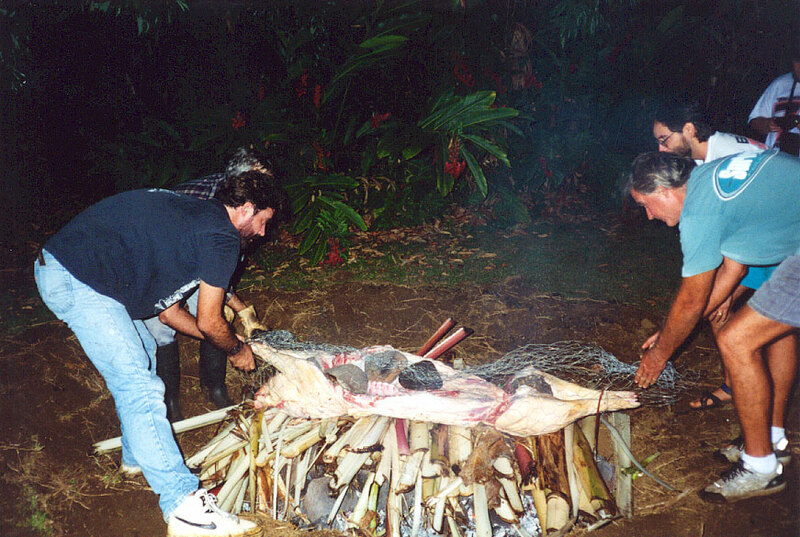 Life is much, much more than a career and what we learned and experienced in Hilo was a wisdom, a unique culture, a worldview, and a sense of family of rare value, something that has forever changed us. All that is gold does not glitter. Hilo is a classic old-style Hawaiian town located on the east side of the “Big Island” of Hawaii. In some ways it is the antithesis of Kona, the dry side of the island: lush rain forests, expansive bays, black sand beaches, and extensive rainfall — over 120 inches a year. It is a stunningly beautiful place: the tropical shores rimmed by black and white sand beaches line the densely forested slopes which rise gently to huge mountains occasionally covered in snow, But mountains they are not; instead, volcanoes. The entire island is composed of five of them, two still very active and two dormant. We bought a 1940s plantation-style house in town on a large lot with a beautiful lanai. It was a simple but elegant house: it was made entirely of old growth Douglas Fir from Oregon; not a single knot in the wood, attesting to the large size of the logs they were cut from — an era as much in the past as Hilo itself. Our roof was made of tin and our downstairs had walls open to the outside with a metal shower that we shared with a large frog, cockroaches and an occasional centipede. It was a porous house open to the elements, the winds and mist. Hilo is also an ancient town, one of the first established in the Hawaiian islands by Native Hawaiians thousands of years ago. Moving there was like stepping back in time: everything moved at a crawl, a sleepy town where the local police directed traffic at rush hour, where people in the small shops lining the bay front are friendly and want to talk story all day. Since Its founding over 900 years ago there have been waves of immigrants from across the globe: New England, China, Japan, Portugal, and from islands throughout the Pacific, resulting in one of the most diverse cultures in the world. When we first moved to Hilo everyone wanted to know why we moved there and where we were from — although considered rude in some places it wasn’t in Hilo as people were proud of their heritage, just as they were proud to be Americans. It was a natural curiosity and we were welcomed with open arms, especially my pregnant wife. Family is big in Hilo, one might say central to the culture. Families are `ohana, extended and multi-generational; great grandmothers mix with newborns in a single house with aunties, uncles, cousins and hānai (adopted) individuals. One of my native Hawaiian students taught me the importance of family early on when she dropped out of the University mid-year — and forever — from her college education, to take care of her tutu (grandmother). It was simply more important than anything else. We have never lived in a place so safe, so supportive, so understanding of the centrality of family and the importance of culture. It was the music that first pulled us in, which was from the heart. Keola Beamer, Hawaiian Style Band, Cecilio & Kapono, Russel Mauga, Gordon Freitas, Imua, and of course Iz (Israel Kamakawiwo’ole) played in our house, on the streets, the stores, and at the local beach parks. Their gentle soulful music and lyrics hearkened back to a lost time and a powerful future. A voice for the Hawaiian people and a mandala for Hawaii. It is a sound that screams out the beauty of the place. But it was the strength achieved through the diversity of the local people that was most enlightening. As our connections deepened through the University and Susan’s founding of the Pacific Tsunami Museum, we were able to spend time with the old-time families of Hilo. There was Bob and Lily Chow, an old Hilo family of Chinese descent whose family owned significant land downtown but were low key, humble, gracious, and possessed a strong sense of community. I still remember a traditional Chinese dinner at their house as one of the best of my life. Then there were those of Japanese descent: the ladies strolling with their umbrellas down the street every day: Mrs. Ito, a small, gentle woman that had survived the 1960 tsunami by hanging onto her screen door as it floated off Hilo Bay in the middle of the night, who brought us freshly cut fern shoots from her garden. Of our Portuguese gardener Joe who slowly but meticulously cut the weeds and maintained our lawn, by hand. Of the old-time Haoles, descendants of European, but primarily American origin that were the original westerners to colonize Hawaii. Friendly and welcoming but personally guarded. Then there were the Hawaiians: Lavada Warren from the University and her mother Rose who lived on our street: quiet, down to earth, friendly, and the most giving people we ever met. And Dave and Helen Heard, who welcomed us to Hilo, introduced us around, and graciously helped us with out two baby luas — no small feat. Of the many Hawaiians I met over the years in Hilo I was humbled by their closeness to the ʻāina (the “land”), their kindness, simplicity and generosity. It pained me to think of how much this generosity had been taken advantage of to destroy their culture over the last two hundred years. Then there were the Filipinos with their Pork Adobo and lumpia downtown; the Portuguese who made malasadas, brought the ukulele to Hawaii and comprised most of the police force; the Pacific islanders, the Samoans, Tongans, Micronesians, Chamorro and others that came to Hawaii because of the similarity to their home islands. But most of the people were part of a rainbow of diversity, combinations of all of the above that is uniquely Hawaiian and gave rise to many of the local customs and the local dishes such as the loco moco at Cafe 100, plate lunch at Leung’s, pancakes at Ken’s, and spam musubi. What I cherish most was that both of our children were born and raised in their early years in the culture of Hilo, which was a childhood paradise. Our lush backyard a great playground, the black sand beaches the perfect place on a sunny day. At night my daughter and I would sit on our warm driveway and count the stars and name the constellations; at the beach she learned the Hawaiian names for all the common critters, pipipi, wana, ha’uke’uke, and of course some of the long fish names such as the humuhumunukunukuāpuaʻa and the lauwiliwilinukunuku‘oi‘oi; by the age of three she was diving to the bottom of the pool to pick up pennies off the deep end. It’s no accident that she just finished her college degree in marine ecology — it’s in her blood. With my son, whom we named Kalani (“heavenly”) in honor of his birthplace, we’d play hide and seek in our backyard jungle, dig through the sand at the beach, and drive his toy trucks up and down the driveway. I’d like to think his name will always give him an attachment to the place of his birth. Something to remind him of his connection to the ʻāina. For each child we had a traditional lū‘au on their first birthday with a pig in an imu, lots of friends and family, Hawaiian music, and an amazing variety of foods. The perfect way to celebrate the end of their first year on the Island, their first year of life. I fondly remember the weeks and months I spent searching the beaches for the perfect stones for our luau. Dave Heard taught me to how to select the proper stones, be patience, and always ask for permission; a lesson that I have carried throughout my life on how to treat the ʻāina. Putting the pig in the ground for my daughter’s first birthday, 1993. And as it was for many that moved to Hawaii we decided after six and a half years to move back to the Pacific NW to be closer to our families, away from the sea. As much as it made sense to do so it was one of the hardest decisions we ever made in our life. 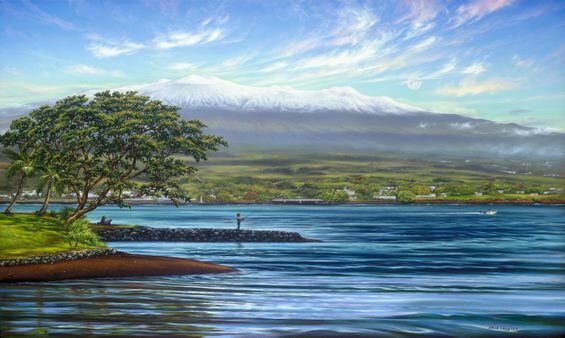 For the first years I shivered during the cold, wet NW winters and my heart ached for Hilo. I missed the culture, the diversity of my students, the food, the music, the beaches and coral reefs, but most of all the winds and gentle fragrant rains. At night I often dreamed of being back, of diving and surfing, of taking my children to the beach, of being part of something special with the ocean, the town, and the University. In our Washington state home we hung the wind chimes on our back deck and they would make their sound as the winter storms passed by and in the afternoon winds blowing off the Columbia River. But the sound was different, still beautiful but harsher and somehow more dissonant. And over the 16 years we lived there, in the snow and ice, hailstorms and thunderstorms, and cold fronts coming off the cold North Pacific ocean, one by one the wind chimes fell apart. As it slowly lost one chime after another the sound changed from a melody to a tinkering and finally to a clang of metal until one day I had to take it down because it hurt to hear it. And although my heart still ached for Hilo its song was fading. Eventually, after many years, we moved closer to the ocean in northern California — to Trinidad — and bought a small house near the ocean. And as I lay awake at night I could once more smell the sea, hear the waves and the wind coming off the Pacific. And I’d think back to our days in Hilo where you could hear the soulful sounds of the wind moving through the trees, the gentle rain falling on the leaves and fronds in our backyard, the light pitter–patter of rain on our metal roof, the smell of the flowers, and the rustling of the chimes. For the sound now was back in my mind and with it all the memories of our special time in Hilo. Forever bound to those winds and gentle rains and the smell of the sea. Eric Dexter here. I had a few classes with you as a grad student working with Steve Bollens a few years ago, which I really enjoyed. I’ve been following your blog, and I really appreciate the time that you’ve been putting into making these retrospective musings public. My family and I are currently living in Switzerland, courtesy of a Fulbright fellowship. We’ve both been doing a lot of introspection on this trip about the possibility of returning to Europe more permanently after I finish my PhD back at WSU. I’ve been mulling over a lot of the same topics that you’ve been writing about: Career, landscape, family, big moves, unplanned events, etc. Since I’m really just starting out on my career, it’s really nice to have your perspective on how all of these choices came together in your life. Looking forward to the next post! Thanks Eric, I appreciate the feedback and glad you are doing well. I have a post about Switzerland coming up!